It’s become a sort of tradition with my friends John and Crista that, when we get together at a bar, we order the same drink every time. It started quite innocently. One night when we gathered locally so I could show them the charm of my hometown, we decided to check out the new bar in town. It was my old hang-out of last summer, reincarnated as something different–that really isn’t any different. Although the bartender was kind of cute. The handsome young man behind the bar recommended we get a round of Irish Car Bombs. Hard to believe but between the collective 60-plus years among us, none of us had had done before. We were game! We waited patiently while the cutie pulled 3 Guinnesses, then set up 3 shots beside them. With a *sink* then a *chug*, a new tradition was born. (I highly recommend only ordering this in bars that do not use plastic shot glasses, by the way…) Fair warning: some people are offended by the name of this drink. Order it at your own risk. The internet is full of cupcake recipes based on this popular beverage, reappearing at exactly this time of year for St. Patrick’s Day. 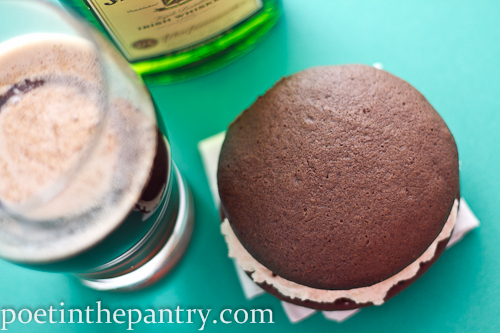 I actually intended to prepare one of these very recipes after I tweaked my whoopie pie recipe a little for my own St. Patty’s Day post. 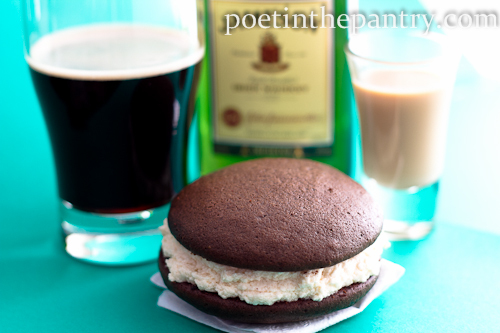 But then inspiration struck–why not turn the whoopie pie into a car bomb? Duh, winning! The Guinness perfectly accents the cake/cookie portion, bringing almost a saltier flavor to the original, plus a real nice moistness. The filling–what can I say? 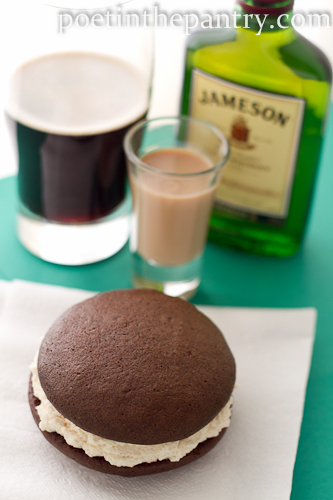 How can you go wrong with butter, sugar, Irish cream, and Irish whiskey? I could sit down and eat it with a spoon. If nothing else, make at least that and use it as you will. Yum! **When you measure the Irish cream, pour 1/3 cup into your measuring cup, then top it off with the heavy cream until it reaches 1/2 cup. Cream the butter, shortening, and powdered sugar for 4-5 minutes. Add the flour, whiskey, Irish cream, and heavy cream, beating on medium high until nice and fluffy–up to 8 minutes. You can add more powdered sugar or cream to adjust the consistency to your liking. Set aside. When you are ready to bake, preheat the oven to 375 degrees Fahrenheit. I prefer to use my 2 dark non-stick pans for this recipe. Cream the sugar and the shortening. Add the egg and beat until well incorporated. Mix in the vanilla. Plop batter onto the cookie sheets using a cookie scoop… the smaller the scoop, the smaller the final whoopie pies. This time, I used my big cookie scoop and got about 9 whoopie pies, plus an extra top to smear filling on. Bake for 8-10 minutes (you can use the toothpick method to check doneness), then remove to a wire rack immediately to cool. Once fully cooled, spread the filling on the flat side of one cookie/cake, apply the flat side of another, and you now have a whoopie pie. Traditionally, these are to be wrapped individually in plastic wrap. I do that, then add them to a ziplock bag, just to keep them even fresher. They’re best on the day made but you can store them for a few days (preferably in the fridge) or in the freezer for a few months. 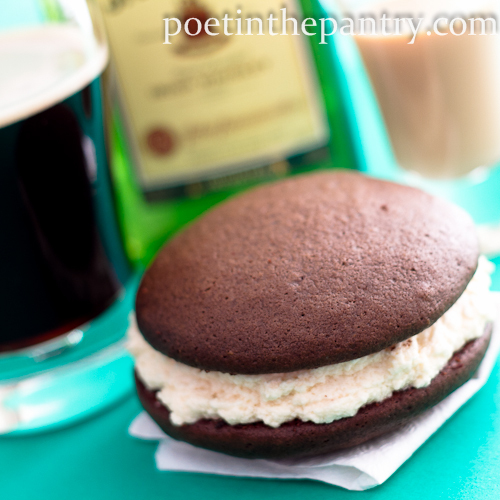 While I don’t mind eating regular whoopie pies frozen, as they’re sort of devil dog-ish, these are best at room temp. March 2014: Please note that I recently changed the title of this recipe. While my intention was to draw a line from the popular drink served in American bars to this dessert inspired by it, I now realize that many people are horrified to find that such a drink name exists. It was not my intention to minimize the pain and suffering of others. You are such a sweetheart! Thanks for including it in your round-up!! 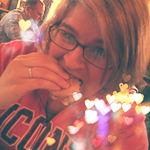 <3 We need to get together again soon! How do you recommend I alter the baking time and temp for mini whoopie pies using a macaron sheet? I’d start checking them at 6 minutes. I’ve made them mini before on the baking sheet and it doesn’t change the time too much,but if your using silicone instead of metal, it could be as much as 10 minutes anyway. Keep a toothpick handy and keep an eye on them. After the first batch, you shout get a feel for the time. This is good advice any time baking, anyway, as ovens vary in how they perform. Enjoy!